Named in honour of the 17th century Dutch astronomer, Christiaan Huygens, who discovered Saturn´s rings and its largest moon Titan, the Huygens probe is the first spacecraft to land on a moon in the outer Solar System. It hitched a ride aboard the NASA spacecraft Cassini before being released on a collision course with Titan in January 2005. Titan is a strange place as it is the only moon in the Solar System to have an atmosphere. This is why planetary scientists are so keen to study it, as it may resemble a very young Earth and so give us clues to our own planet´s evolutionary path. Unfortunately, the dense atmosphere of nitrogen with some hydrocarbons veils the moon´s surface in an opaque orange smog. Launched back in October 1997 the Cassini-Huygens craft took the scenic route, visiting Venus twice, and the Earth and Jupiter once. These four gravity-assist swing-by manoeuvres (to use the jargon) gave the Cassini-Huygens craft enough of a boost to reach Saturn and saved the equivalent of 68 tonnes of rocket fuel. Nine years before the launch our speaker, Professor John Zarnecki from the Open University, joined the team that he would head as Principal Investigator for the instrument known as the Surface Science Package (SSP). This was one of six onboard experiments mounted on the underside of the probe and was designed to provide unique information about the physical properties, structure and composition of Titan's atmosphere and surface. To the relief of Prof Zarnecki and his team, the probe safely made it through the atmosphere and landed with a relatively gentle thud on Titan´s surface. At best the team was hoping for perhaps 3 minutes of data on the surface but the probe managed to transmit for 72 minutes to the Cassini spacecraft flying overhead. In fact the transmission was only ended by Cassini disappearing over the horizon out of reach of Huygens´ transmitter. 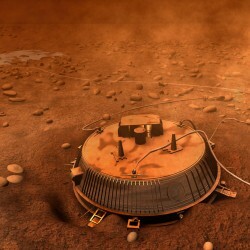 Analysis of the data suggests that the probe landed near what appears to be a shoreline next to a large flat basin surrounded by rolling hills 100-200m high. In some regions the landscape has a steeper topography probably due to violent episodic rainstorms where liquid methane takes on the erosive powers of water. Threading from these hilltops down to the basins are dendritic channels resembling river drainage channels on Earth. The pressure is about one and a half times that of Earth and the surface is thought to be similar to that of a gravel-sand mixture with freezing temperatures of -179(deg)C. A snapshot taken by the probe from the surface shows a dimly-lit orange world where the Sun´s rays struggle to penetrate through the thick haze. Scattered on the dark plain are small pebbles made of water-ice and no signs of any liquid apart from some scouring at the base of a few rocks. If this is a glimpse of our distant past on Earth then it just shows us how far we have come.